This article explains how to track down and cure a sewer gas odors that appear to be due to basement or crawl space floor drain or drain trap problems. We describe the likely sources of sewer gas or septic smells that seem to come from a floor drain, and we explain how to complete the diagnosis & cure of these odor problems. This article lists solutions for stopping sewer gas odors & sewage backups through un-trapped or un-sealed floor drains and lists sources of trap seals, trap guards, and check valves used for that purpose. 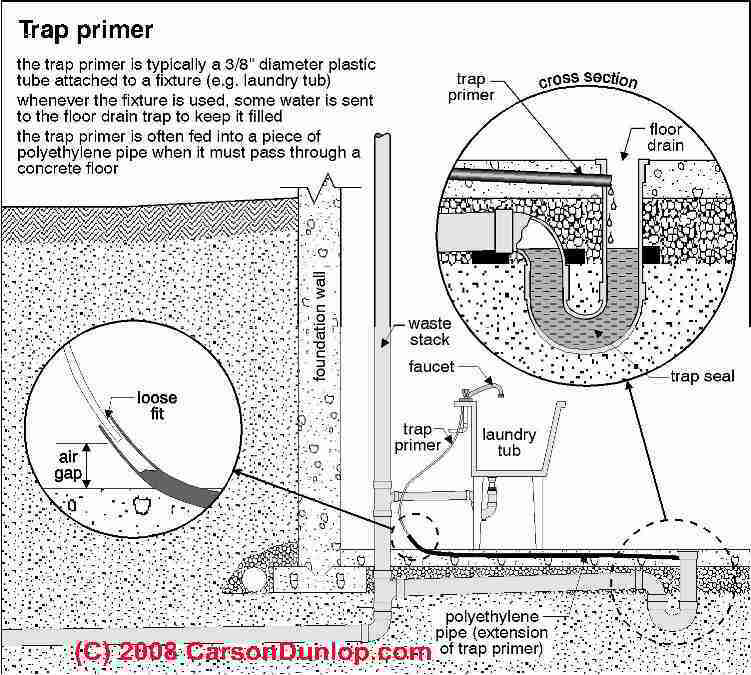 The sketch of a plumbing trap primer system shown at page top was provided courtesy of Carson Dunlop Associates. Our photo at left shows use of a floor drain that may be an odor source. Draining air conditioning or heat pump condensate in this manner can solve two problems at once. Avoiding a dry plumbing trap and disposing of A/C or heat pump condensate. I am having a heck of a time finding where the septic odor is coming from. We have a 3 story house on a septic tank and drain field. The odor seems to be strongest and most often present in a mechanical room in the basement. The only plumbing in the room is a floor drain [photo at left from reader]. No other drains are under the concrete slab. I know because I built the house. I suspect that drain, but the water level in the trap seems to be full and I even sent a metal feeler down to make sure the bend in the trap was below the water level. The concrete floor does have settling cracks. Is it possible that the plastic drain pipe could be slightly cracked or loose glue joint down stream from the trap, caused by the settling concrete? Would plugging the 4 inch drain just outside the house and filling the drain with water up to the top of the floor drain give enough pressure to any leaks thereby lowering the level of the water in the drain? Assuming all the other drains downstairs are slightly higher than the specific drain in question. Only other thing I can think of, is the roof vent plugging from leaves etc. going down a 2 in. vent stack. If that plugged, would that allow gas to come into the building? 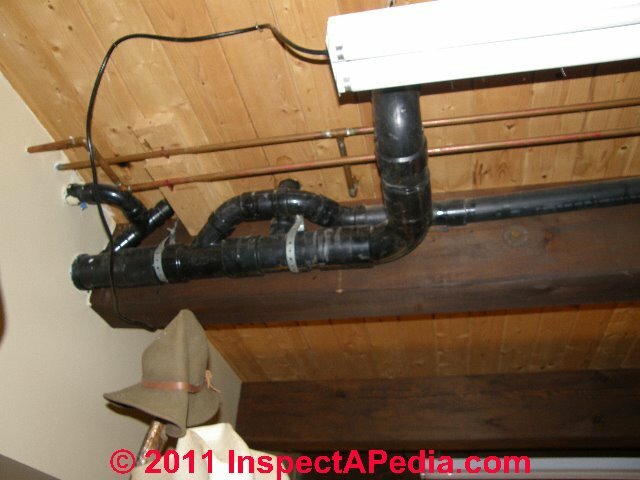 [Photo at left (from reader) shows a portion of the drain-waste-vent DWV piping in this building.] This house is 30 years old and this problem is about a year old. This question is a tough especially with all the floors being finished with tile or carpet. I was an electrical contractor so I do have tools and abilities for any of your suggestions, i.e. : shove a metal fish tape down the drains and then trace the tape to verify the drain path under the concrete slab. Any help is appreciated. Thanks, - D.M. We have also found roof vents blocked by wasp nests, and once even a frog. If you can safely examine the vent from rooftop without falling off due to snow or other slippery conditions, it's worth taking a look. Other plumbing vent failures that send odors into buildings include a vent or drain line that is disconnected inside the building due to an unglued joint or broken drain line; These should show up as an odor or when you perform a pressure test of the vent line. Of course if your floor drain piping is actually used to drain a plumbing fixture (such as a washing machine) and the drained fixture is more than 5' from any plumbing vent, then depending on what waste flows through that drain line, it could on occasion siphon water out of the trap and allow odors into the building. It is also possible to siphon water out of a remote but un-vented trap as waste passes down the joined drain line, but that problem would have been present from the time of original construction whereas your problem has just recently appeared. And you've confirmed that there is water in the basement floor trap so that's not our first suspicion. Indeed we have had cases of under-floor drain lines that were leaky, sending sewage odors into the building; that problem is more common when the under-floor drain is carrying sewage. See CAST IRON DRAIN LEAK, ODOR, REPAIR for an example. 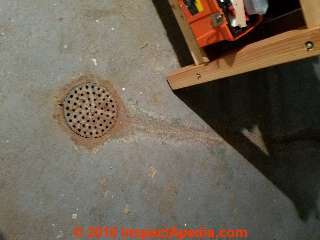 If you have easy access to this same drain line from outdoors and can temporarily block the line at that point it would be a good diagnostic tool since you are sure that there is no other plumbing connected to this drain. If you block the line from outdoors (and at a point before it joints any other sewer piping) then if that's the odor source, the odor ought to stop. If that step confirms that the line is the odor source, and presuming the building is new enough that your piping is plastic not cast iron under the floor, I'm guessing that the bad news is the line would have to be abandoned (sealed off outside) or dug up and replaced. 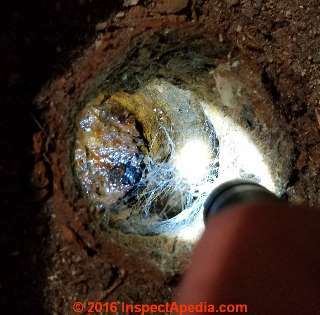 Before doing so it may be worth asking a plumber who has a drain line inspection camera to send that through the line to see what's going on, on the chance that you can find and dig up just a short section of line that is damaged or disconnected. It is interesting that you found the floor trap filled with water. 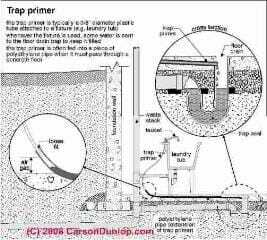 Often a floor drain whose only function is to catch on-floor flooding in a basement is so seldom used that its floor trap dries out and sewer gases pass backwards into the building. We solve that problem either by pouring some mineral oil into the drain trap or installing a floor trap that includes a check valve designed specifically to prevent gases from passing backwards up the drain line and into the building. When a building is more than a year old and the floor trap is always filled with water, and if we think that the drain line is never used, where is that water coming from? Is that a clue that there is water under the building leaking into the trap (i.e. an open or broken drain)? the odor is not from that drain line but perhaps from another building drain leaking into the basement ceiling or walls. other "sewer-like" odors that might be found in a mechanical room could be from some different source - a dead animal, a chemical spill, or if there are odors in the building water supply, sulphur in the water or if in hot water, bacteria or a bad anode in the water heater tank. Are we sure we know the piping layout under the floor, the materials used, and quality of connections? Do floor slab cracks or other signs of settlement mean that slab movement may have damaged the under-floor drain piping? See CONCRETE SLAB CRACK EVALUATION. What drains in to this floor drain? Anything? or is it just for water spillage? In other words, are we sure that the drain line connected to absolutely no other building plumbing? Whole drain is not 4 in…4 inch is a main drain with taps off of it under the slab. The floor drain in question is a 2 inch line and trap. All abs piping. Drain in question is just for spillage as is the other one in a different room. The reason water is in the trap is because I diligently keep it full. Have thought of putting antifreeze, like a travel trailer uses, instead of mineral oil. But not until this is settled. Check all roof vents this morning with a 1/4in metal fish tape. No restriction and a visual with flash light showed no problem. Also, the gas odor coming out seemed consistent at all four roof vents. Since last writing, I did plug the 4 in drain just outside the home and then filled all the pipe under the slab until the water level was even with the top of the floor drains. I left it for 14 hours and the water level never changed. Therefore, I feel there is not a big leak under the slab. I suppose a real small leak might take more time to be apparent. An air test would be more accurate but would complicate plugging the pipe completely. After plugging the 4 inch line, I aired out the house and no odor returned. This makes sense because all the lines leading to the septic tank were plugged with water. Also, this morning I had the tank emptied. It probably could have gone another three years, but because of the problem, I had it cleaned anyway. After careful review of when this intermittent problem occurs, It seems like the odor follows the draining of one particular bath tub. The tub was used for three consecutive days, and each of those days we had the odor. Is there any type of flushing action that can cause the odor getting through. Remember, this is a problem that occurs when it is cold out, not neccesarily freezing, and the problem started a year or so ago and we have been here for 20 years..I can’t even think of a place where a nail could have been put through a pipe. No one works on this house but me..
Keep in mind that some basement floor drains don't include a trap and may need one to stop smells from that source. Dry traps at un-used sinks in a basement or other building area are also common sources of sewer smells in buildings. Because sewer gas contains explosive methane, it can be dangerous. The floor drain shown above included a clue that prior owners/occupants of this Poughkeepsie NY home had experienced basement water entry: someone had cut a small trench in the concrete basement floor to direct water from a point of water entry at the house rear wall over to a floor drain. 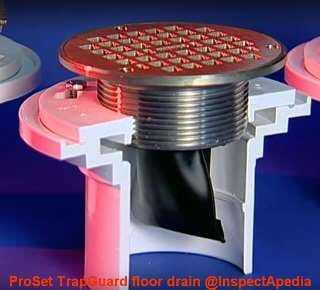 Watch out: it is common for basement floor drains to be installed without any trap whatsoever. Basement floor drains or in-slab floor drains in buildings without a basement or crawl space are intended to handle either spills onto the floor or un-wanted building water entry in order to reduce indoor flood damage. But depending on the routing and destination of an in-floor drain, ground water, floodwaters, or even sewage from a septic or sewer backup may flow up the drain and into the building in some conditions. 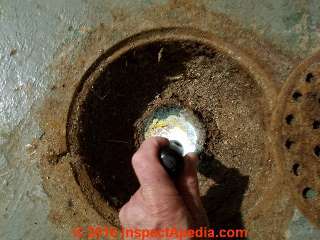 When investigating sewer gas odors in buildings we have often traced these smells to an un-trapped floor drain. We also describe this problem at SEWAGE PUMP ODORS. Below: we have removed the floor drain cover to take a look into the drain piping. As you can see below, the floor drain does not appear to have a trap installed. While some floor drains are routed indepndently to an acceptable drainage destination such as daylight above-ground or to a storm drain, others are connected to the building DWV system and ultimately to a septic or sewer piping system. Piping the floor drain to a septic system is not a smart idea as it risks overloading and damaging the septic system. Piping floor drains to a community sewer or storm drain system is prohibited in some jurisdictions. I want to thank you for having an easy to use site. I had been dealing with a "smell" in my home that came and went. I have a cat that occasionally brings in a mouse,bird or larger critter that will pass on while in the house. This was the type of smell. Death. No simpler way to put it. I looked under all the furniture, moved the washer and dryer, no little dead critter to be found. Turned my attention to the septic system. I was just getting ready to call a septic company and thought I would "Google" my issue and see what I could find. After reading really vague and useless page after page I came upon your website. There was the answer, plain as could be. Dry drain. We have a shower that hadn't been used in a few months, along with some very windy conditioned dried the plumbing. I turned on the shower and let it run for a few minutes along with pouring a few gallons of water down a floor drain in my laundry room. Smell left almost instantly! I wish I had found your website first. Your information is so very much appreciated, and the time you took to put it out there for us to use. Thank you in return for such a generous note. We work hard on our information and are thus thrilled when a reader finds it useful. We also welcome criticism, content suggestions, or question. My cat, one of them, used to bring snakes into the basement - they were not always dead either. For dry floor drains or for that matter any plumbing fixture drain trap that is likely to remain un-used for a long time - long enough to let its water trap evaporate - I pour about 3/4 cup of clean mineral oil into the trap. Like water, the mineral oil seals the trap against odors leaking back out of the drain system and it also lasts longer than water. For floor drains that do not include a trap there are two options to stop the back-drafting of sewer gases up through the floor, the first of which is to simply cover over the drain. 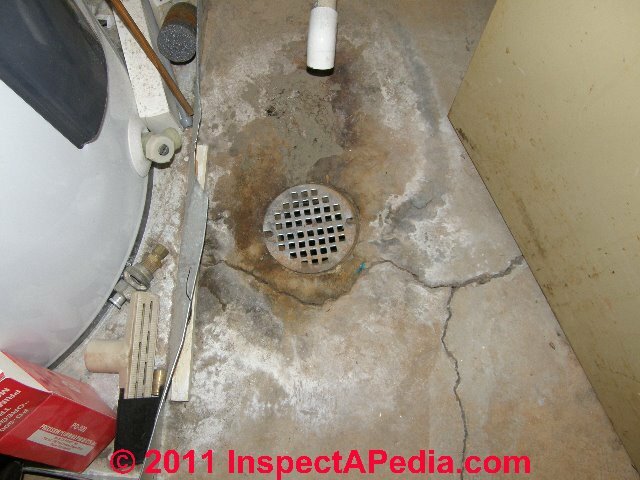 I don't recommend actually filling-in or abandoning the drain nor do I recommend a permanent seal or cover over the drain, since that approach will prevent using the floor drain should water spill or leak onto the floor in the future. But simply laying down a thick piece of plastic or perhaps taping it down to the floor on three of its four sides will stop nearly all sewer gas leakage but still can permit water to enter the drain if there is standing water on the floor. Several manufacturers including SinkStopper provide an automatic close-trap seal device that is an add-on product used to stop sewer gases from coming back up out of a dry floor trap. The best solution is, no surprise, the most costly and most troublesome. For floors subject to frequent spills or water entry at which keeping a working floor drain open is important, it may be cost-justified to ask your plumber to install a floor drain trap that includes a check valve. This solution probably requires chopping out the old floor drain and cutting into the drain line to install the combination check valve and floor drain trap. The Trap Guard is normally in the closed position, sealed tight like no other system. It opens with as little as one ounce of water but will allow a flow of 34.5 GPM of waste water when opened. The Trap Guard has been tested in accordance with the ASSE 1072 test standard for ANSl/ASME A112.6.3 drains and by Warnock Hersey for the CSA B79 General Purpose Drains. It was evaluated by the ICC Evaluation Service and listed under ICC-ES-PMG Listing 1091. The Trap Guard is accepted as a code approved alternate to using a Trap Primer. Primers have been used for many years using various type devices. The problem is they usually stop working after a short period of time because of numerous water related mechanical problems. The Trap Guard has no mechanical moving parts and provides a 10 year limited warranty. Quad Close Trap Seal Device (Fig. # 2692) [PDF] from Sink Stopper, Excerpt from product description: The Quad Close Trap Seal Device creates a watertight seal inside the drain and/or throat of the strainer. for the floor drain. It will open to allow the flow of drainage and close when there is no flow. 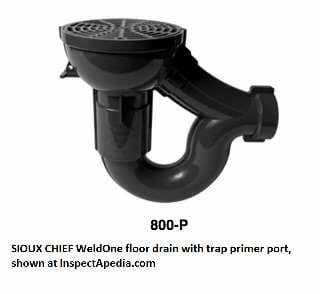 The trap seal is for use in the floor drain outlet or the throat of adjustable strainers. SureSeal 3-inch in-floor Drain Trap Seal (About $50.) This is a waterless, in-line floor drain trap seal with backwater protection to prevent both sewer gas escape through the floor drain and sewer backups through the floor drain. Excerpt from product manufacturere's description (Amazon 2016/06/06) SureSeal 3" Floor Drain Trap Sealer meets the stringent new ASSE 1072 plumbing code standard for all floors and all floor drain flow rates. Patented engineered design creates no effective restriction on water flow. Every SureSeal product meets or exceeds all code requirements. SureSeal blocks dangerous and noxious sewer gas emissions from backing-up into living or working areas. SureSeal's Space-Age elastomeric neoprene material has been proven in plumbing industry uses for forty years and has been used in non-plumbing critical applications for almost fifty years of continuous use without degradation. Successfully tested with common cleaning solutions and other chemicals approved from drain disposal. Functions despite lodging of common debris (mop strings, food residue, etc.). InspectAPedia is an independent publisher of building, environmental, and forensic inspection, diagnosis, and repair information provided free to the public - we have no business nor financial connection with any manufacturer or service provider discussed at our website. We do not sell products nor services. Dickenson, T. Christopher. Valves, Piping, and Pipelines Handbook. Elsevier, 1999. Lee, Joseph HW, David L. Wilkinson, and Ian R. Wood. "On the head-discharge relation of a" duckbill" elastomer check valve." Journal of Hydraulic Research 39, no. 6 (2001): 619-627. Lee, Joseph HW, Jaydeep Karandikar, and Peter R. Horton. "Hydraulics of “duckbill” elastomer check valves." Journal of Hydraulic Engineering 124, no. 4 (1998): 394-405. Continue reading at PLUMBING SYSTEM ODORS or select a topic from closely-related articles below, or see our complete INDEX to RELATED ARTICLES below. 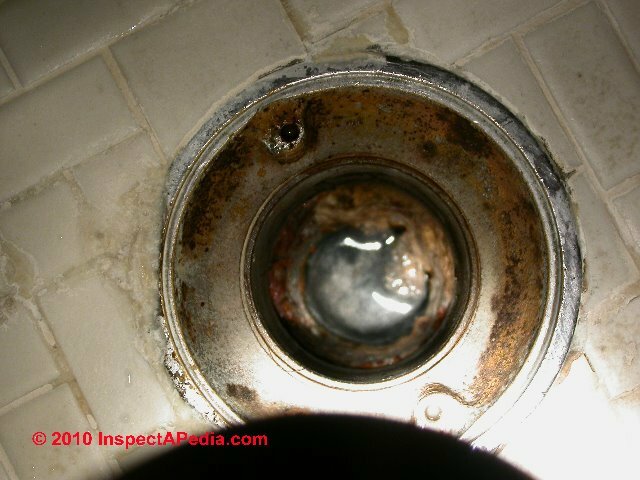 FLOOR DRAIN / TRAP ODORS at InspectApedia.com - online encyclopedia of building & environmental inspection, testing, diagnosis, repair, & problem prevention advice.